A Clickfunnels Affiliate Review - What Type of Support Can You Expect? In this article, we're going to walk through exactly what it means to be a ClickFunnels affiliate and what kind of commissions you can expect. What kind of support you can expect once you become a member. How complicated is it to promote ClickFunnels, and then how much money you can make from it in an ongoing basis. I'm going to show you the back end in terms of my account, and all of the things that we're able to promote through this amazing software. Right here, we're on our ClickFunnels dashboard. Here, up under “Account” there's going to be an area called, “Affiliates” in the dropdown menu for ClickFunnels. You go ahead and click that, and it'll bring you over to the ClickFunnels Affiliate area. Now, inside this area, you're going to have access to your commissions. We just started promoting it heavily over the last few weeks, and we're doing really well. We hadn't earned very much with the platform, but over the last few weeks, we've been able to earn quite a bit. You can see 20% of our revenue coming in. It's just over the last week. That's because we've never really pushed this program before. What we found is there is so little competition out there right now in terms of promoting ClickFunnels. There's not a lot of people doing it. The ones that are doing it, they just use a shotgun approach. They blast something out, like maybe a blog article or a YouTube video, the user affiliate link and they let the traffic and the results come in once and they call it good. What we've been doing is creating and promoting content on a regular basis about this platform through blogging. I'll show you how we do that in case you're interested in learning how to promote via your blog. It's a very powerful strategy that you can use to get some really good commissions. Keep in mind, these are ongoing commissions. ClickFunnels is a monthly paid membership program. Their commission rate right now is 40%. For the basic package, which is $97 a month, you earn 40% of that per month for every person you sign up through your affiliate link. That comes out to a total of $38.80 per month. Every person you sign up amounts to quite a bit. All you need are a hundred signups and you're basically earning four grand a month. For most people, they could quit their job after doing that. 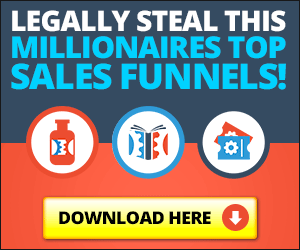 In fact, Russell Brunson, the founder of ClickFunnels has training in here to show you exactly how to leave your job behind by promoting this software. It is not very intuitive the way they laid it out back here. It's more techy than anything, unfortunately. But if all you remember is one thing, this very first blue button here at the top that says “affiliate tools get my links” will take you to where you can get your primary ClickFunnels Affiliate links. They have a Facebook group, which I've joined. Go through their affiliate bootcamp training, which is really neat because it's free. It was free when I went through. I don't know if it's still free. Let's go ahead and click on it and see if the ClickFunnels Affiliate Bootcamp is still free. You can join a 100-day challenge they run inside this affiliate bootcamp. To do so you'll just enter your e-mail address. I would create a new e-mail address just for this information so that when you join the 100-day challenge, your e-mails aren't getting lost in your inbox with all the other e-mail subscriptions, maybe, you've signed up to. It's really good training, I'll be honest. I haven't gone through the whole thing because we don't have to. We have a marketing background, so we understand how to promote programs like this. But I can tell you, from everything Russell has done, everything Russell Brunson has done, it's going to be first class because he does everything first class. There's a lot of offers on this other page. We'll go back to that to see what you can promote, and there's different ways of promoting those. I'll show you where to get those links in a second. If you continue scrolling down, there's a way to get your dream car promoting Clickfunnels, and it'll show you how far along you are towards qualifying. It doesn't count members until, I think, they've reached a certain point. Someone that just signs up and they're a member, and they're in the trial period, they don't count there. There's some other criteria for that. But once you hit 200 members, and actually it used to be a hundred I think. They've raised it, but once you hit … Oh wait, 100 active members will cover the lease of your dream car. 200 active members and you can get, for this kind of a lease of $1,000 a month, I'll tell you, you can lease things like BMW i8, super cars and things like that. If you can get to a hundred, they'll lease a pretty nice car for you. That's just on top of everything else they pay you. You can also promote Russell's Funnel Hacks Autowebinar, and you can also promote his Funnel giveaway. These all put the subscriber, so if they go into the webinar, put some into Russell's list and he begins following up with them. Your affiliate link is still good, so if they buy anything, then you get paid. Now, the 14-day free trial is what I really like to promote because that's where you get your members. That's where you get your monthly subscription-based members that sign up and you get that $40, or whatever it was a month for those signups. Want to get paid when others promote ClickFunnels? They have a two-tiered affiliate commission platform pays you 5% commission on everything anyone you sign up promotes. It's two steps, which is really nice. You can get paid if you sign up somebody that's going to promote ClickFunnels. You can get paid one more step in depth. It's a really low commission on the second tier but it's still pretty neat. If someone's not already involved, this will take them through the process of getting started in the ClickFunnels Affiliate bootcamp. You can promote the dream car. So that this dream car program that comes with ClickFunnels, you can get people to see how that works and get involved in ClickFunnels. If you sign up like companies, they get on ClickFunnels, you can earn a lot more money every month. You can earn one time commissions for people that go through the master class and things like that. This is the link right here that I use most often. I insert this link in every hyperlink and anchor text hyperlink that I put on my blog pretty much. I promote the free offer more than anything because it gets the visitor to sign up for the 14-day free trial, and then they begin using ClickFunnels for their MLM business. One of the things we'll do to help people along is we understand just human nature is to subscribe to something or pay for something and not do anything with it. What we like to do is we like to take a preexisting funnel that we already have and share that with them so that they actually have a funnel built inside their platform. We offer that as like an incentive to the direct sales professions. We'll offer free sales funnel if you sign up for ClickFunnels through our link, and then we'll share our funnel with them and we'll go in and we'll go to YouTube and grab, say, some of the corporate videos associated with whatever niche or company they're with, and we'll embed those in the video containers inside ClickFunnels. I'll show you what I mean. If I come back here to the home page and you come down here and you look, you see THRIVE Two-step Business Funnel. That's actually a funnel that we created for a network marketer who was interested in using ClickFunnels. They used our link, and we shared this funnel with them, and we embedded their videos. We created a business opportunity page, which is the first page. After they opt in name, e-mail, phone number, they're taken to a “Thank You” page, which on that thank you page is where we insert all the THRIVE YouTube videos that are applicable, including a link to the company's compensation plan, their products, some of their life-changing inspirational videos, their trip incentives and things like that. If someone from another network marketing company came to us and wanted the same thing, we would just share this funnel with them. We go into their account, ask for their login information after they signed up with ClickFunnels, and then we would just change the wording, change the video containers. It takes maybe 10-15 minutes to do, and get them rolling as well. Once they have a funnel in their account to promote, we shoot them an e-mail once it's done and we just say, “Here's the link right here, the very first link. Share that with people on your Facebook page. Share that with your warm market, and that'll get you started. Then, you can start making phone calls to leads, and you're off to the races. You can even run paid advertising to this if you wish to see how it performs. That's how we did it in the direct sales profession. Now, there's also banners if you like promoting using banners. They have all sorts of different sizes you have to pay attention to. I tell you, banners don't convert that well. It just depends where you put them. You need to find a good website to put the banner on, and then you can start testing these different banners. There's also e-mail swipe copy that you can also use for ClickFunnels. Pick one of the subject lines for an e-mail, like “Want a free ClickFunnels account,” and then use the associated body copy, and don't forget to insert your affiliate link for ClickFunnels once you sign up and get your affiliate link, and I showed you where to get that in this video above. There's other courses like the funnel giveaway and then funnel hacking course, and more associated banners. You should have no problem promoting this program with all these tools that Russell Brunson and the ClickFunnels team give you. If I come back here and I go back to “Affiliates” again, it's going to take me to that same page I showed you before. If I don't click the first blue button, I'll show you where it takes me. If I keep scrolling down, it's going to show me some other stuff. You can see down here below, there's other products you can promote. That's a book. It's a really good book. If you want to promote that, there's a link here to go to the page to get the affiliate link for that. This is another book of his that you can promote. Expert Secrets, also a book on internet marketing. All the affiliate links for these associated things are on the blue button. You just click the blue button. For example, Expert Secrets Book: I click this, open it up, the blue button, open it up, takes me to the affiliate page and right here is where I would grab my affiliate link. Again, it's the standard 40%. That's the number that they've chosen, and that's what the commissions are. And they show you here what all your potential earnings could be in this funnel for these products. Expert Secrets, and of course, Russel Builds a Funnel, that follows Expert Secrets. He gives away expert secrets for free. Just makes them pay shipping and handling, and then he starts upselling them in the funnel with these other products. You can earn upwards of $927 in this funnel just by promoting this one book, which we do. If you were to go to our website, our blog, and our blog roll page, you'll see in the sidebar, we actually promote Expert Secrets in the sidebar. We have a banner for it. If you were to click that, it would take you to the associated link where you can download Expert Secrets and just pay shipping and handling. You can see there's my affiliate link, 125791, and here's Russell's page where they promote the book. You just pay shipping and handling. Pretty cool. You begin going through his funnel, which looks like this right here. He sells all of those in that funnel, and you get 40% on all of it. Again, there's more banners and more e-mail swipe copy to help you out. You can see, there's the banner I'm using right there. Russell Brunson and the team over at ClickFunnels, they've done an amazing job, and it's very, very easy to be an affiliate for this software. He gives you a lot of stuff that you can promote. 40% is a very generous commission in terms of what you can find out there online to promote. I've seen higher, but when it comes to recurring, that's pretty high. Hope you enjoyed this ClickFunnels Affiliate Review, and leave comments below. Share on social media if you found value!